The Elephant Falls located 12 kilometres from the main city got its name from a British officer because an elephant like rock was spotted beside the fall. However, the rock is no longer there, ever since it was destroyed in an earthquake. Locals gave the name ‘Ka Kshaid Lai Pateng Khohsiew’ to the falls which means ‘Three Steps Waterfalls’ because the falls comes in three-tier falling in succession to one another. It is located near the Shillong Peak. To visit the falls the best season is monsoon, as the water level rises and you get to see water gushing down the rocks. Monsoons are in the months of June to September, if you simply want to induce the nature then the months of October to February is best. Photography, trekking (about 200 steps to reach the bottom) and shopping from the souvenir shop at the main gate are some of the things to do there. You can get a taxi or a public bus at MTDC bus complex in Shillong. Bishop and Beadon are one of the most spectacular twin falls in Meghalaya. Bishop falls is a three-level stream, rolling down the East Khasi Hills from an altitude of about 443 feet. Beadon fall has rough edges and rocky hills and stones while the Bishop has a flawless stream cascading down like a silky cloth. Tucked amid thick forests, Beadon falls offers stunning view of the surrounding. Beadon waterfall cascades through rocky hills while the foamy water of Bishop gushes down to form a deep plunge. Both Bishop and Beadon Falls, drop down to a deep gorge of Umiam River and flows through picturesque Suna Valley. The Bishop Waterfall is around 450 ft in height, which is the 22nd highest in the country. Again the best time to visit the falls are in monsoons in the months of June to September. The month of October to February is also a good time to visit. From Shillong, drive up to Mawlai in Mawprem. The motorable road ends at Mawlai. A five-minute trek from there will take you to both the waterfalls. Swimming in the plunge pool, day picnic, spotting wildlife like leopard, wild cats and langurs are some of the activities to do there. Though not popular as others, Sweet Falls is a cascading beauty, located near Happy valley. It lies about 5 km from Happy Valley and is about 96 metres (315 ft) in height. The spot is encircled with scenic Khasi Hills and pine forests. Sweet Falls is also labelled as one of the most dangerous waterfall in Meghalaya. Being surrounded by slippery rocks, Meghalaya tourism department have prohibited tourists to go close to the falls. An uninterrupted long stream of water cascades down the steep slopes of Shillong, creating a breathtaking experience. It is believed by the local people that this fall is haunted. If people go in odd number, they return in even number. The waterfall has also been the subject of numerous suicides and is infamous for many deaths. You can enjoy the beauty from Happy valley, but cannot trek down to reach upto the waterfall. Sweet Waterfall is 12 km from Police Bazaar, Shillong. Drive through Hopkinson Road and Demthring up to Mawshbuit Sweet Falls Road. A waterfall located in the heart of the city is reason enough to go see Crinoline falls. Dropping from a height of 13 metres, the fall cascades in a large pool at the bottom surrounded by orchids. This gives the tourists an opportunity to take a dip in the icy cold water. Flowing near the Lady Hydari Park, the Crinoline falls are not to be missed. The Tourism department of Meghalaya organizes some festivals on the banks of the swimming pool. There is also a small zoo there, which is why it is popular with children. You can also get taxis from Shillong Police Bazaar outside the MTDC complex. Buses are available from MTC bus terminus. One of the most spectacular waterfalls in the state is Mawphlang. Cascading down through multiple tiers from a great height, it is located inside Mawhplang Sacred Forests. The water falls into a small plunge pool which is the perfect place to relax, and spend some time amidst the tranquil nature. The water is extreme clean and pristine surrounded by lush trees. Drive down the Mawsynram-Shillong Road for about 25 kms to reach this place. The approach road is forested and a little trek is required from the end point of the road, to reach the falls. You can spend some leisure time in the water of the plunge pool. The local people worship trees of the Mawhplang Sacred Forest. Trekking through this forest and experiencing the worship is also a memorable experience. You can also get taxis from Shillong Police Bazaar outside the MTDC complex. Situated near Dwaki at Indo- Bangladesh boarder, Bophill Falls is an unpopular yet extremely beautiful waterfall in Meghalaya. This is a gushing stream, that showcases its grace and majesty during rain and post-monsoon. A favourite among nature lovers and photography buffs, it offers panoramic view of Khasi hills on one side and plains of Bangladesh on the other. You have to drive 90 kms from Shillong to reach Dwaki. The waterfall is just about 5 kms from Dwaki. Photography, swimming and boating at the Umngot river. In the midst of a remote, quaint village in Sohra, Meghalaya lies Garden of Caves, or Ka Bri Synrang, a stunning place of full of waterfalls and ponds. It is situated 10km from Laitryngew region near the Laitmawsiang village of Sohra. Laitmawsiang also known as the garden of caves doesn’t have the traditional waterfalls. Instead it has an interesting mix of waterfalls, rock formation and pools. Although this waterfall is not difficult to reach unlike some other waterfalls in Meghalaya, very few people know about it. The place is tranquil with few people milling about it. There are a few natural showering stations where you can have fun. It is a 2.5 hectare property with seven major spots – Ka Synrang Syiem (the king’s cave), Sum Syiem Falls, Ki Stieh Maw (warrior rocks), U Mawdohnud (heart-shaped rock), U Mawkhyllung (baby rock), Arsdad Falls, and Riat Umlwai Falls. The best time to visit, to specially enjoy the waterfalls in their full glory, is in the months of August and September because the area experiences maximum rainfall. You can take a full-day taxi from Shillong to Laitmawsiang and Garden of Caves. 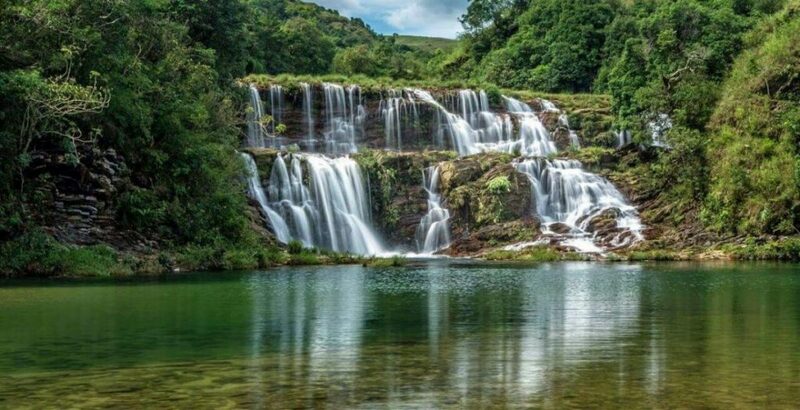 Wah Rashi falls is located in Syntung, which is 70 kms from Shillong, the Wah Rashi Kshaid river is a congregation of nine waterfalls, known as the Wahrashi Water Falls. The Wahrashi Falls are encircled by a cluster of sacred hills. The nine-tier falls, start from hills, form beautiful gorges and finally become a part of the Wah Rashi Kshaid river. Until now, only three tiers of the waterfalls are accessible to the public. The other levels, although visible, are not accessible. The area surrounding the waterfalls is mostly wild vegetation, with pitcher plant saplings growing in abundance. The first tier of these falls begin Northwards from the Khasi hills and the second tier from the North. There is a dam in between these two falls, where they merge together to make the third tier of waterfalls. Although the roads are not good, you can take a sumo, zeeps, SUVs from Shillong. It takes about 2-3 hours to reach there. Located in the cleanest village in Asia, the Mawlynnong Waterfall is a sight to behold. Gushing through the lush greens and the steep hills, the mere sight of the waterfall rejuvenates the soul. The sheer volume of the waterfall sounds like a roar and is a sight to behold. The best time to visit Mawlynnong falls is during the monsoons (June -September) when the volume of the water in the falls is maximum. There are beautiful, colorful orchids surrounding the area. Located about 90 kilometers from Shillong and 92 kilometers from Cherrapunjee, Mawlynnong is well-connected to these towns by road. You can hire a cab or taxi from Shillong or Cherrapunjee.